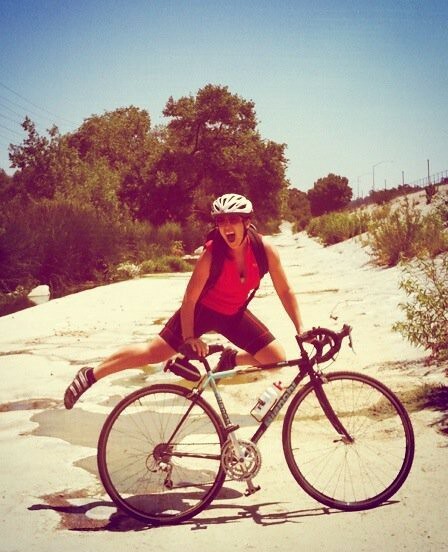 Oooh Cycle Ladies and Gents – please give a round of applause for our latest Commuter Profile starlette – hot, strong, and ready to bike down the red carpet… SARAH EBERHARDT hailing from Los Angeles, California! Sarah Eberhardt commutes in downtown L.A.
Sarah bikes to LIVE, here she is in San Diego, CA. How long have you been a bike commuter? Why did you start riding your bike to work and how long is your commute? Let’s rephrase the Q – I bike to live and know that 2 miles is my ideal commute. I drew a 2 miles radius around my workplace, and chose where to live that was precisely 2 miles away from work. Any more than that, I’d get lazy some days (come on – who doesn’t find an excuse to drive their car if they have one? ); any less, it wouldn’t be enough cardio to jump start my day. Sarah with the baby blue Fuji Bordeaux, prior to thieving thievery... in Taos, NM. How does Bike Commuting help you with your lifestyle (economics, health, relationships)? How does bike commuting NOT help my lifestyle? I could go on for days, but bike commuting was the primary purpose of my move to Los Angeles – where all conditions align for the epitome of bike commuting environments – sunshine 364 days a year, no rain, no flash storms, acute temperature deviations from 70 degrees, mildly conscious drivers – all giving me a daily commute unlike the norm in Los Angeles. Definitely all smiles in Downtown LA, I love it! I have a smile on my face every day I am going to work. My commute time is not based on traffic pattern surprises or sudden road closures – it is 12 minutes each way, plus or minus one minute for red lights. I save gas money. I save parking fees. I save parking hunt headache in downtown LA. 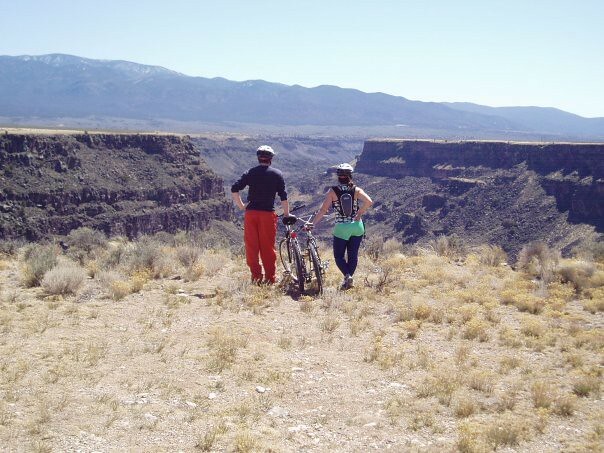 Hmmm, this one doesn't look like commuting in Copenhagen... must be mountain biking the Rio Grande in Taos, NM! 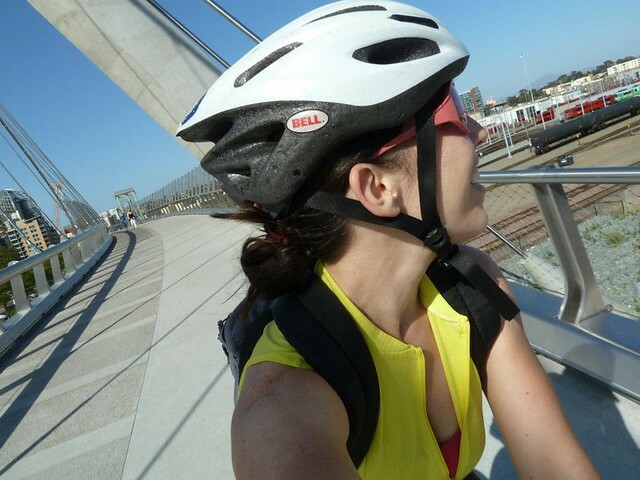 What do you do for a living and in what city do you bike commute? 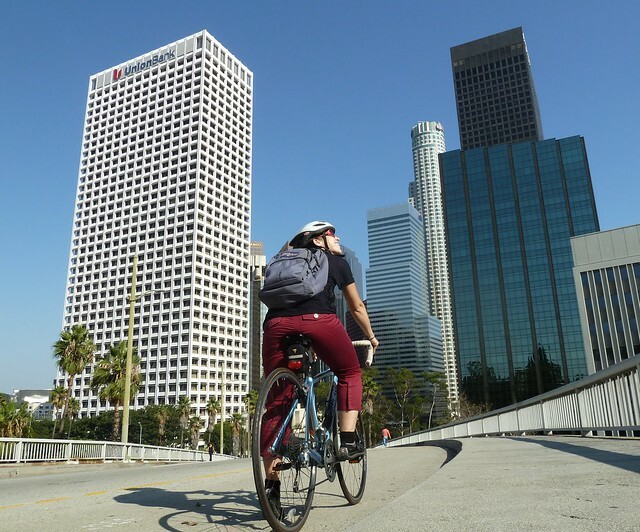 Architect by degree and banquet server by recession, I bike commute daily within downtown Los Angeles. 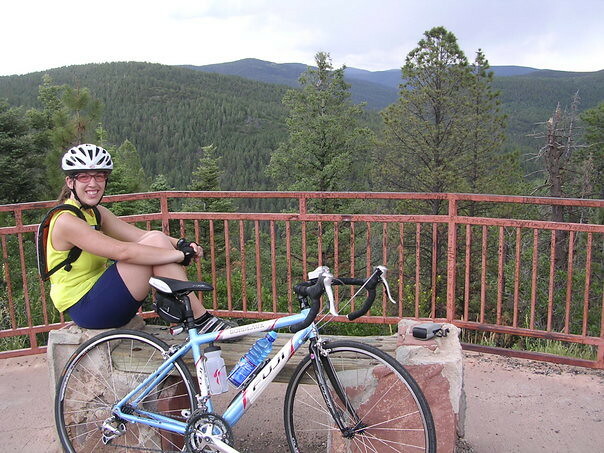 I have owned a bike and commuted while living months at a time in Cleveland, OH; Cincinnati, OH; Copenhagen, Denmark; Berkeley, CA; and Taos, NM. What kind(s) of bike do you have? I’m on my 3rd road bike since 2005 and her name is Igriega (because it sounds like “egret” and it is my favorite Spanish word – she makes me fly past the egrets that wade in the LA River along many of my weekend warrior rides). She is a solid carbon fiber Trek Madone and the bike of my dreams. She soars me through the heavy clouds (cough cough *smog*) of LA. 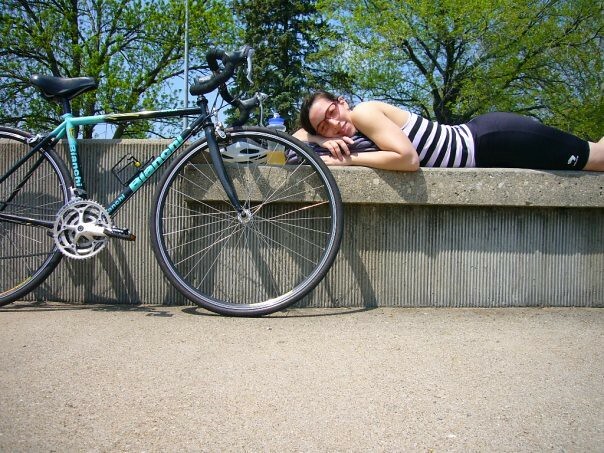 Thugs for Life, Bikes for Life - laying down with her black Bianchi in Cincinnati, OH. Prior to her, my virgin roadie was an aluminum baby blue Fuji Bordeaux- stolen on Berkeley’s campus (NEVER USE CABLE LOCKS!!). My interim roadie was a steel black and teal Bianchi Imola – the thug bike – I suspect it was a stolen bike (even though I checked it with stolenbicycleregistry.com) and again, was stolen off the trunk rack of my car in Koreatown LA. That bike had bad bike karma – it was destined to be passed from thief to rider to thief to rider. I also own a less momentous Iron Horse mountain bike for non-road friendly treks. "What the hell?!" - Mir.I.Am's reaction. Any funny or interesting commuting story that you may want to share? 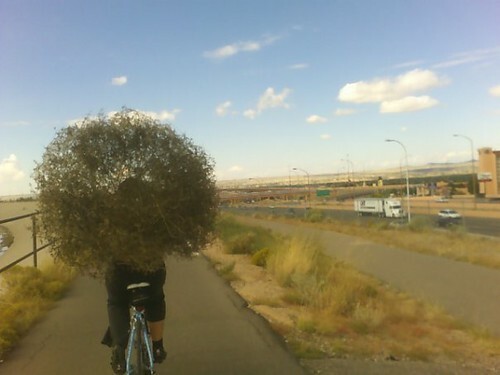 While living in New Mexico, I once carried home a 3 foot diameter tumbleweed on my back that I found to use as décor. It is a lot harder to bike one-handed with a large prickly odd-shaped object strewn over your shoulder! 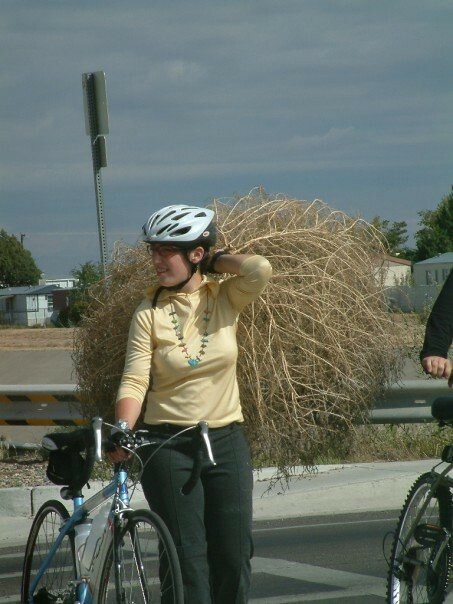 Response from Sarah, "Tumbleweed in Taos, NM!" Obviously. What do people (coworkers, friends) say when you tell them that you are a bike commuter? If you’re surrounded in steel, it’s not necessarily safer than riding on top of steel. So yes, it is as safe as driving in a car, and yes I use bike lights. How about bicycling advocacy? Are you active in any local or regional advocacy groups? Anything else that you want to share with us? YES, I’m renowned for a series of jumping photos in epic places — some of these places I was lucky enough to have had my bike along for the journey. Jump photo time on the LA River trail. 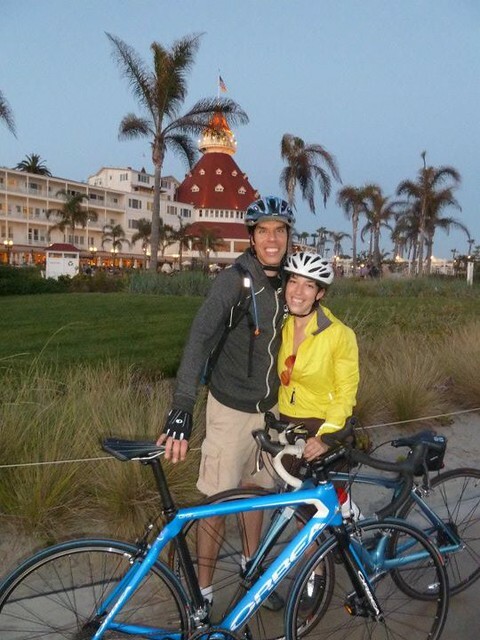 Coronado Island in San Diego, leisure ride with Sarah's man Valentin for weekend warrior adventures. 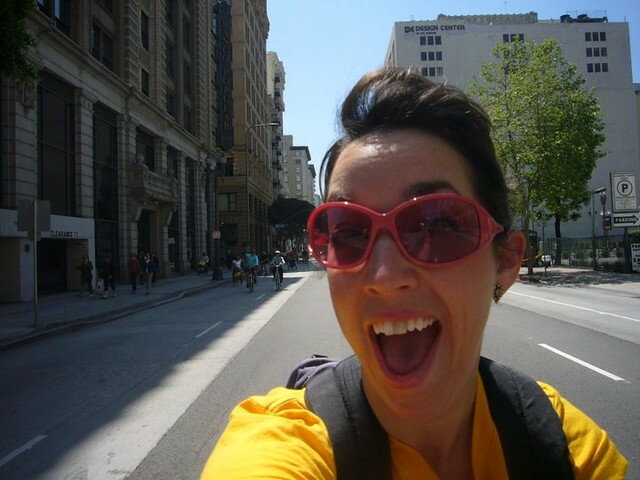 Sarah, thanks for sharing your fun-fun photogs and awesome sauce profile with us. 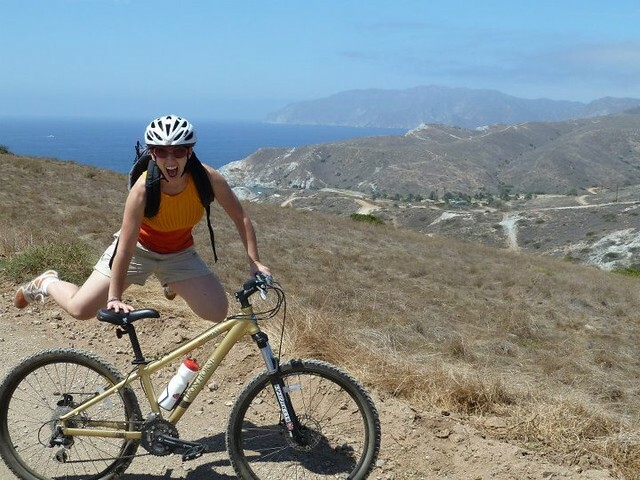 You’ve reaffirmed my personal belief that women on bikes are just plain hot! Want to show us your ride and tell us all about it, lovely Bike Commuters? Then send an email and we’ll hook you up with a Commuter Profile questionnaire! Email mir[at]bikecommuters[dot]com for details.